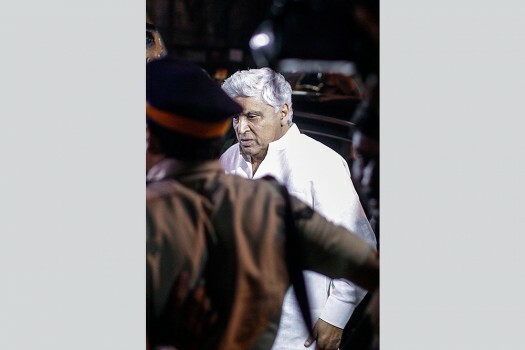 Javed Akhtar at Anil Kapoor's house to offer his condolences to Sridevi's family, in Mumbai. 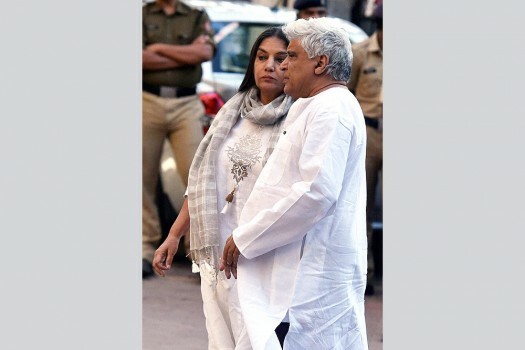 Actress Shabana Azmi and lyricist Javed Akhtar attend the funeral of actor Om Puri, in Mumbai. 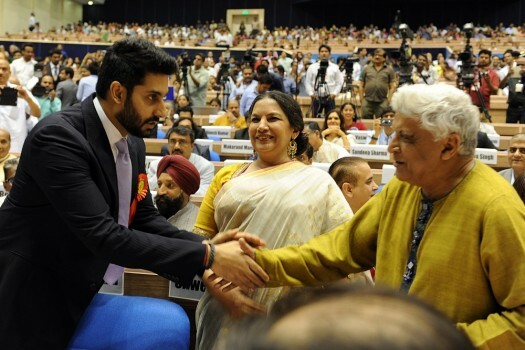 Abhishek Bachchan greets Javed Akhtar and Shabana Azmi at the 63rd National Film Awards in Delhi. 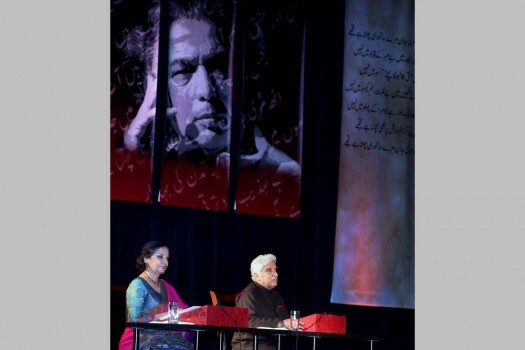 Shabana Azmi and Javed Akhtar recite poetry during "Kaifi Azmi aur Main" a romantic Saga in Jersey City. 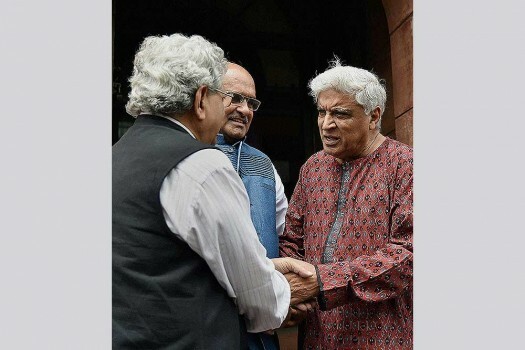 CPI(M) General Secretary Sitaram Yechury, JD(U) MP KC Tyagi and Rajya Sabha member Javed Akhtar at Parliament House during the ongoing budget session in New Delhi. Writer Javed Aakthar talks with Trinamool Congress MP & Party deputy leader Derek-o-Brien during " Kolkata literaray meet" at Victoria Memorial hall, Kolkata. 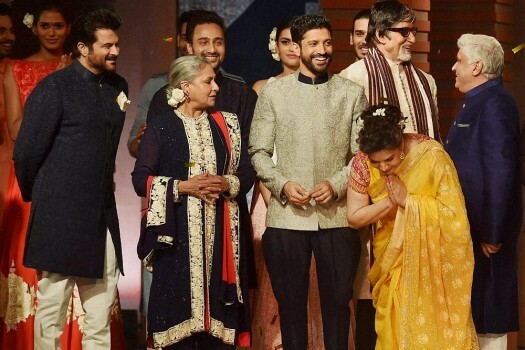 Amitabh Bachchan, Jaya Bachchan, Anil Kapoor, Farhan Akhtar, Javed Akhtar, Shabana Azmi walk the ramp during fashion show 2015 for Shabana Azmi's Mijwan Welfare Society in Mumbai. 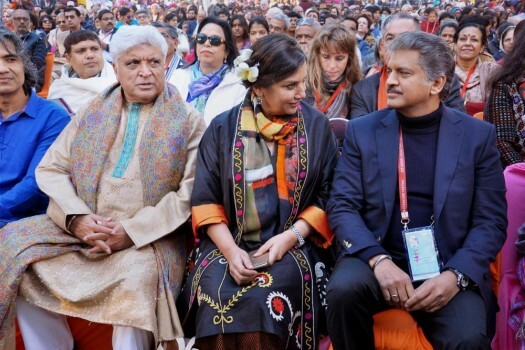 Actress Shabana Azmi and her husband lyricist Javed Akhtar celebrate Holi at their residence, in Mumbai. 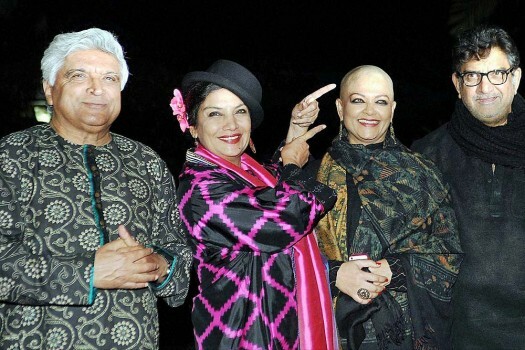 Lyricist Javed Akhtar, actor Shabana Azmi, Tanvi Azmi and her husband and cinematographer Baba Azmi during Farah Khan's 50th birthday celebration, in Mumbai. 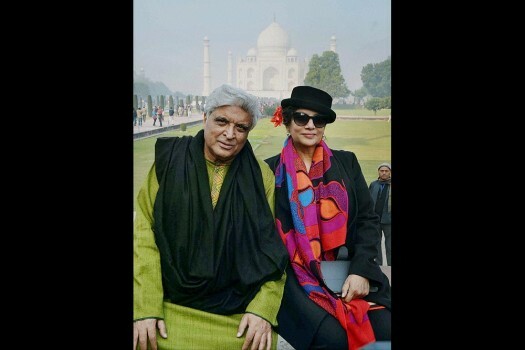 Lyricist Javed Akhtar with his actor wife Shabana Azmi at the Taj Mahal, in Agra. 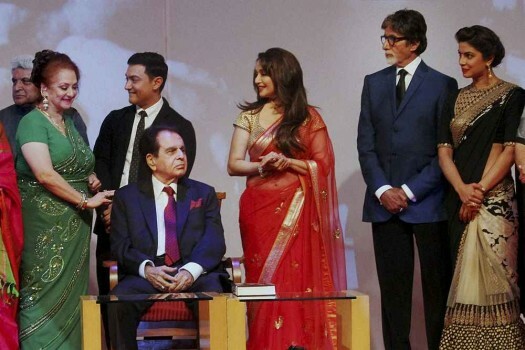 Javed Akhtar, Saira Banu, Aamir Khan, Madhuri Dixit, Amitabh Bachchan and Priyanka Chopra during the launch of veteran actor Dilip Kumar's autobiography in Mumbai. 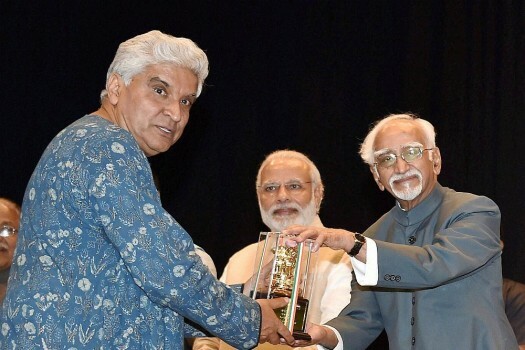 In conversation with producer, story writer and creative director Sandip Singh on PM Narendra Modi biopic and his clarification on using veteran lyricist Javed Akhtar’s name on the film’s trailer. 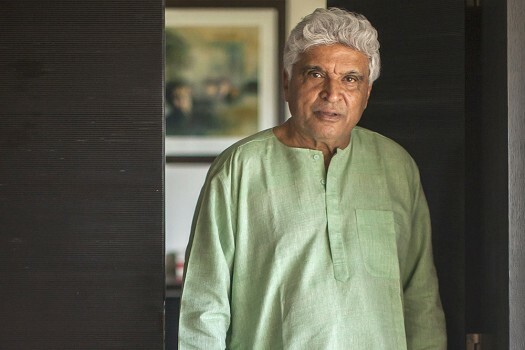 Veteran lyricist Javed Akhtar on Friday said he has not written any song for Vivek Oberoi-starrer 'PM Narendra Modi' and he is shocked to find his name in the credits of the film's trailer. 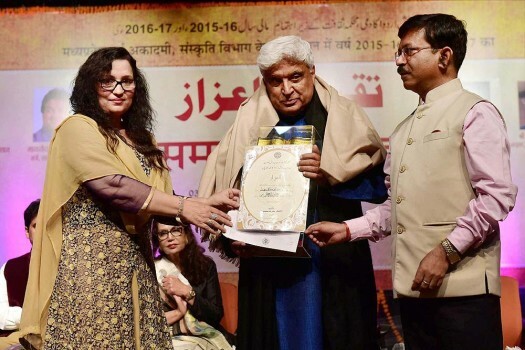 Veteran lyricist-screenwriter Javed Akhtar says he does not understand the agenda of Pakistan to sponsor terrorist activities in India. 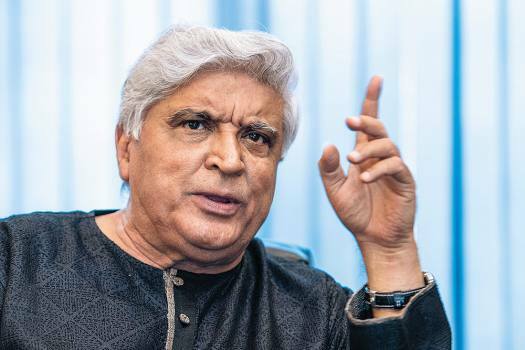 Bollywood celebrities extended their warm wishes for legendary writer-lyricist Javed Akhtar who is celebrating his 74th birthday on Thursday. 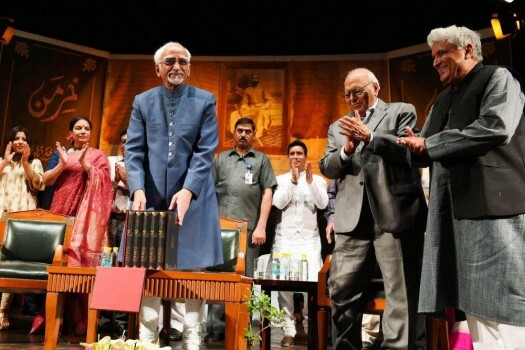 At the last hearing, the Gujarat government had objected to the report, saying Justice Bedi has submitted it without consulting the members of the monitoring committee. 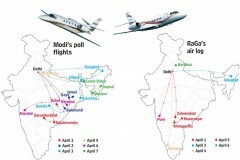 Celebrities from Indian film and music industries like Rana Daggubati, Abhishek Bachchan, Nandita Das, Javed Akhtar and Hariharan came together to help Kerala Flood Victims. The AMU students alleged that the protesters were from Hindu Yuva Vahini, and were allowed to leave a police station even after being initially detained. 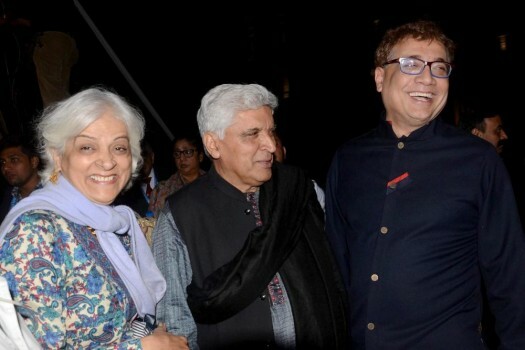 The 73-year-old lyricist-writer, who spoke on the sidelines of "The Walk of Mijwan" event on Thursday night, said better values should be instilled in boys. 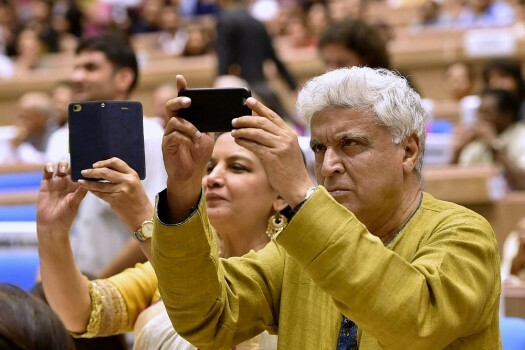 On 60th anniversary of 'Mother India', noted writer-lyricist Javed Akhtar says that "the history of Indian cinema cannot be complete without this timeless classic"
The Buzz Around That Celeb Is Unreal! Humans, prophets or ­pedestrians, have ­always had ­followers. The social media age offers dummy followers at a price. And there’s a ­profit too. Anna is all-permeating. Bollywood isn’t immune. But they’re okay with that. Can you really express your conviction through your confection? India's favourite creator of heroes deconstructs heroes and the audiences that fete them and emulate them. Javed and Farhan Akhtar stand on either side of a chasm of sensibility—anger and feelgoodness typify their respective lived histories. 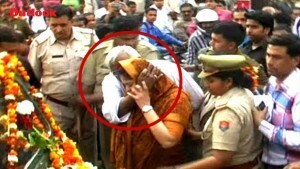 Yet, father and son manage to get together.